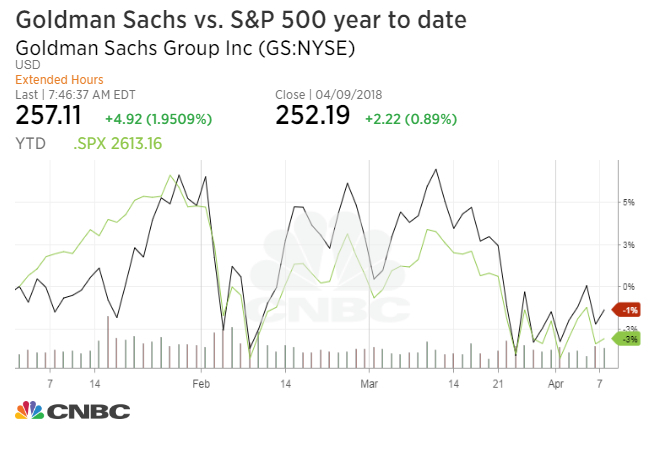 Investors should buy Goldman Sachs stock as rising interest rates and rebounding revenue put the bank in the “early innings” of a new growth story, according to Bernstein. Investment banking, management and lending have overtaken trading as Goldman’s leading source of revenue, wrote analyst Christian Bolu, who initiated coverage at outperform. Goldman’s trading business has recently struggled, with fixed income, currencies and commodities revenue down 50 percent year over year in the fourth quarter. The bank has looked to move away from its trading business as it focuses on more successful areas. Its investment banking arm, for example, saw $2.14 billion in net revenues for the fourth quarter and $7.37 billion for the year, its second best ever. These fundamental changes will likely buoy the company’s shares, added Bolu, whose $300 price target implies nearly 19 percent upside over the next 12 months. The Dow Jones industrial average component is outperforming the market so far this year, down 1 percent versus the S&P 500’s 2.2 percent decline since January. Shares of Goldman rose 1.7 percent Tuesday. Last month, Goldman named David Solomon as president and chief operating officer at Goldman, putting him in line to succeed Lloyd Blankfein. Solomon’s background is in investment banking. Goldman Sachs is set to report first-quarter earnings on Tuesday before the bell. Bernstein expects net revenues of $9.22 billion and diluted earnings per share of $5.75, well ahead of Wall Street consensus expectations as reported by FactSet.